1. Get a Certificate of Eligibility (COE). The first step of the VA loan application process requires that you must qualify for a VA loan. A Certificate of Eligibility, or COE, assures the lender of your military status, eligibility for the loan, and your entitlement. You may request a COE from your VA-approved lender, or go to the online Veterans Information Portal to print one for yourself. Providing your lender with a COE early in the application process gives them information concerning eligibility and entitlement that they need to proceed. Veterans must give their lender all of their financial information, including current income and all existing assets. 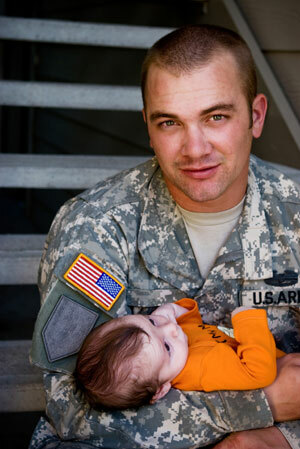 Veterans should also give their lender information concerning their debts. Bring tax records, paycheck stubs, w-2s, savings account statements and investment information, as well as any other financial documentation regarding assets and income to your lender. The lender will most likely run a credit history report in addition to all this information. With all this information, Veterans can pre-qualify for the VA loan. Pre-qualifying means that Veterans can provide a documented estimate of how much funds can be borrowed, which will be helpful later on in the loan application process. Property eligibility is an important part of the application process since there are qualifying factors not only for borrowers but also for properties. Properties that are typically approved for VA loans include single-family residences, some approved townhomes and condos, multi-family properties of up to four units, and some approved manufactured homes, provided they are affixed to a permanent foundation. Properties must be appraised and comply with the VA inspection standards to qualify for VA financing. 4. Order a VA appraisal. A VA appraisal is crucial to the home loan application process and will be required by your lender early on. A professional VA approved appraiser, must give a fair evaluation of the home's value as well as a rigorous safety inspection. All VA home loans are completely LTV, or loan-to-value, meaning that the value of the property must be equal to or higher than the purchase price. If any safety hazards exist that prevent immediate occupation, they must be dealt with before closing. Before you can be approved, a VA loan underwriter will need to confirm that you are an acceptable credit risk as mandated by the VA guidelines. The underwriter will use your financial documents, your credit report, and the appraisal to finalize your VA loan application. After you are approved for a VA loan, you will work with your lender and a third party title company to close on the loan. The VA loan documents, which can include both loan and title documents, will be signed at the closing. If you are closing on a home purchase loan, you can take up residence in your new home within the specified time after closing.